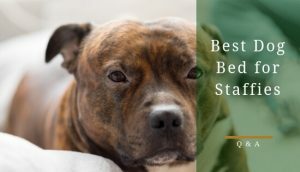 Staffies are one of the most popular dog breeds. Due to this, it’s important we discuss the appropriate range your pup’s weight should fall within. Making sure your bull terrier’s inside this range is key to ensuring your dog lives a long and happy life. After all, we all want our staffy’s to live a long life: one that might even exceed the agreed upon lifespan range of a Staffordshire bull terrier. In this article, you’ll learn the target range you should try to keep your dog’s weight within. Additionally, you’ll find inside this article ways to make sure your dog never becomes overweight. What is the Ideal Weight for a Staffordshire Bull Terrier? Like most dogs, a staffy’s weight range is different for males and females. A healthy weight for an adult male Staffordshire Bull Terrier should end up between 13 to 17kg. For an adult female staffy, it’s slightly less with their weight range coming in between 11 to 15.4kg. This is according the Kennel Club Staffy breed standards guide. Being a medium-sized breed, staffies don’t weigh that much particularly when compared to breed like Great Danes or Saint Bernards. But, as any staffy owner knows, this doesn’t stop them from being extremely strong. Therefore, it’s imperative you don’t underestimate their power, or you’ll be on the ground getting licked to death by your wonderful dog. Now, if you find yourself worrying because your staffy falls outside these ranges, don’t fret there are ways to get their weight down. In fact, you’re staffy might be perfectly fine, there’s always an outlier or two to these weight ranges. Remember, these are just averages. If your dog’s weight is outside these ranges, do consult a vet to make sure everything’s okay. Without proper amounts of exercise, staffies are prone to getting restless. Their restlessness comes out in pillows being torn, or shades getting ripped apart. However, this isn’t its worst effect a lack of exercise can have on your dog: becoming overweight holds that title. Given Staffordshire Bull Terriers are prone to hip dysplasia, you need a good handle on the right amount of exercise they require. See, the extra weight will put more pressure on the hip, which will cause arthritis to become a more likely condition for your pup. To avoid arthritis from becoming an issue, The Kennel Club recommends that one hour of exercise or more per day is needed to keep your staffy happy and healthy. 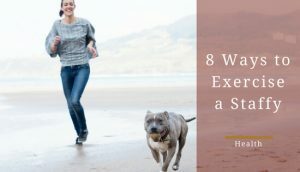 If an hour of exercise is too much of a commitment for you, look for another way to fulfill this requirement for your dog. 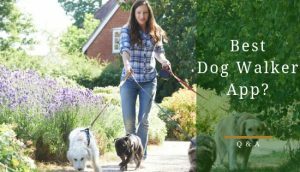 Whether it’s a dog training class or getting a dog walker, getting this hour of exercise for your dog is vital to keeping them in good shape. 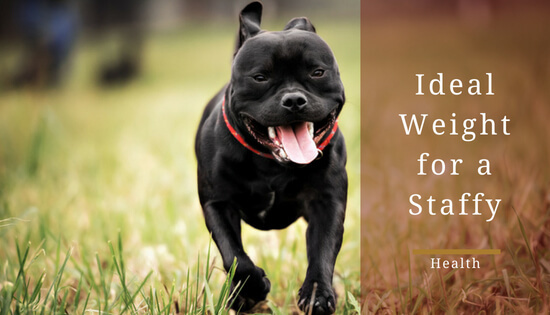 For some interesting exercise ideas, check out our article on 8 ways to exercise your staffy. An easy fix is switching the store bought treats with vegetables. Those store-bought treats aren’t helping your dog lose weight, in fact, they’re probably one of the main factors your pup’s having weight trouble. Instead, vegetables such as baby carrots, celery, or green beans are a healthy alternative to these highly processed store-bought treats. These vegetables also have a great variety of health benefits besides controlling your dog’s weight such as helping get rid of food and plaque build up on their teeth. Before feeding these vegetables to your dog, consider steaming or boiling them. 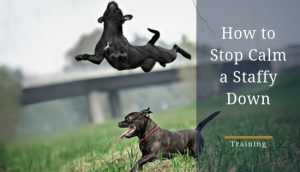 By doing so, you’ll increase their flavor and give your staffy an extra incentive to enjoy them. 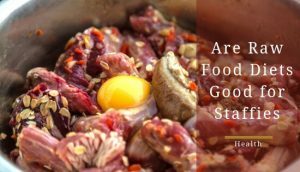 Take a look at this article to discover 11 healthy “human” foods for dogs. Certain health supplements can give your pup an edge when it comes to losing weight. For example, omega-3 fatty acid supplements are a great way of keeping your dog’s weight down and promoting good health. 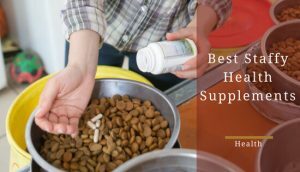 This supplement encourages weight loss, while, providing your dog with a potent antioxidant that has been proven to help treat and prevent diseases. Another helpful supplement is l-carnitine. In some studies, l-carnitine has shown to aid weight loss and encourage muscle mass. 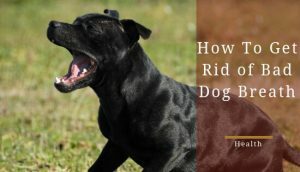 Due to this, it could act as a secondary means of pushing your pup to their ideal weight. Of course, it’s imperative you consult with a vet before giving either of these supplements to your dog. You never know what might cause your dog to have an adverse reaction. Many dog owners have a rather relaxed approach to how how much they feed their dogs. They’ll fill the food bowl to the top without measuring or researching what’s the right amount of food for their specific dog. In response, their dog ends up becoming overweight that leads to many overwhelming health problems. Due to this, it’s essential you understand the exact number of calories your dog needs for each meal. To receive this information, contact a vet for a proper evaluation of just how much calories your dog needs each day. If you’re in a bind and can’t contact a vet right away, the formula below is a good starting point to understand the number of calories your staffy needs. For example, if your dog weighs 17 kilograms, the ideal calories per day would be around 580 calories. However, using this formula should be a short-term solution until you can contact a vet about a professional diet plan for your staffy. On top of calorie control, make sure you are feeding your dog the best quality dog food available. After figuring out how many calories your dogs needs, use a measuring cup to ensure you’re giving your staffy the right amount of food. Even though this step is vital to maintaining a dog’s weight, many owners skip it because they think it’s a hassle. However, you can accurately cut the calories your dog needs into portions to fit your daily routine by using a measuring cup. To give you an example, I’ll use the model of the 17kg staffy I used in the section before. If you want to cut your 17-kilogram dog’s food intake into two sessions, one in the morning and one at night, the calorie intake for each session should be around 290 calories. Using the guides on the back of your dog’s food bag, see how much 290 calories equals in cups. In other words, figure out how many calories per cup and go from there. You have a typo “For example, if your dog weighs 317 kilograms” – that’s a BIG dog ;>)! HA, I definitely wouldn’t fancy taking that dog for a walk!! Thanks for the heads up, Will.